The theme of World Diabetes Day 2017 is Women and diabetes – our right to a healthy future. IDF estimates that 20.9 million or 16.2% of live births to women in 2015 had some form of hyperglycaemia in pregnancy. Approximately half of women with a history of GDM go on to develop type 2 diabetes within five to ten years after delivery. Half of all cases of hyperglycaemia in pregnancy occur in women under the age of 30. 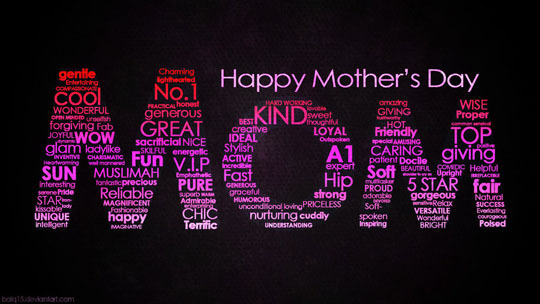 Motherhood is a special phase in a woman’s life and is a bliss if the woman is healthy throughout pregnancy . Pregnancy brings physical and psychological changes which can cause discomfort and woman is not able to enjoy this precious period . Ayurveda recommends ‘ Garbhini Paricharya ’ i.e. Care and regimen during pregnancy which aids in wellbeing of mother and child . There are certain conditions which every woman faces during pregnancy . These common complaints can be taken care of with Ayurvedic remedies . This occurs during early weeks of pregnancy and usually subsides by third month . Cooled decoction of tender leaves of mango and blackberry ( jamun ) mixed with honey should be taken . Electuary prepared with lemon juice , jujube , seeds of pomegranate , sugar and honey should be licked . Licking the paste of white sandalwood with gooseberry juice , mint and honey is helpful . Pulp of wood apple ( bilva ) with curd and sugar should be taken frequently . Ginger with lemon juice and rock salt in small quantities ( ginger jullienes steeped in lemon juice with rock salt can be kept in a jar ) . Seeds of pomegranate can be chewed . Mix powders of dry ginger , cumin , celery with jaggery and honey and a pinch of it to be kept in mouth . Tamarind pulp with sugar , coriander powder and ginger is helpful . Lukewarm water for drinking . Water treated with small cardamom or fennel or coriander should be taken at regular intervals . Gulkand ( Rose jam ) with milk at bedtime relieves constipation. Decoction of Triphla ( three myrobalans ) is helpful . Milk treated with fennel , taken with 1 teaspoon of ghee at bedtime . Licorice with dry grapes and milk should be taken . Intake of fluids ie milk , buttermilk , lemon water , fresh juices , soups etc and salads , fruits should be increased . Coconut water , sugarcane juice , grape juice are helpful . Seeds of cucumber with crystal sugar ( mishri ) relieves the burning micturition . Powder of Lotus seeds and water caltrops should be taken . Decoction of puncture vine ( gokshura ) , Tinospora cordifolia ( guduchi ) , Asparagus ( shatavari ) relieves infection . Decoction made with coriander , vetiver and nutgrass soothes the intestines . Pulp of woodapple ( bilva ) , dry ginger , parched barley with curd and rock salt is helpful . Decoction of lotus seeds , pomegranate bark and mango leaves should be taken . The intimate relationship between the physical and psychological wellbeing of a mother and her child has always been obvious . Motherhood is a memorable phase that is for lifetime – beginning from pre pregnancy care leading to pregnancy and post natal care . In Ayurveda , pregnant woman is compared to a pot filled with oil . As slightest jerk can cause spilling of oil , similarly slightest carelessness can lead to various complications . Today’s changing lifestyle is a major cause of increased incidences of pregnancy complications . Ayurveda specifically describes the Antenatal and Postnatal regimen for safe motherhood and healthy child called ‘Garbhini Paricharya’ and ‘Sutika Paricharya’ respectively . Ayurveda describes that as proper season, fertile field, water and good quality seeds are essential for good crop, similarly the normal menstrual cycle, healthy female reproductive system, proper maternal nutrition and healthy sperm and ovum are requisite for conception and healthy child. There are certain conditions which every woman faces during pregnancy. These common complaints can be taken care of with Ayurvedic remedies . As the physiological status is altered during pregnancy , significant changes both in structure and function take place in all the organs . So special care for even minor complaints should be taken . Incidence of Pregnancy induced Hypertension (PIH) , Eclampsia , Gestational Diabetes etc is increasing now a days . In these conditions , Ayurveda helps in limiting the maternal and fetal complications . Herbs are helpful as a supportive treatment along with the modern medicine under supervision. 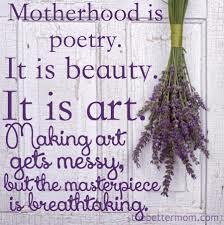 Post natal period is like a second birth for a woman . It is the period to replenish the vital elements lost during pregnancy and giving birth to the baby . Great emphasis has been laid on post natal care i.e. Sutika Paricharya , as during this period she restores her health and strength. Breast milk is the best nutrition a mother can give to her child. Feeding the child is the most satisfying and fulfilling experience for a mother . The child should be breastfed exclusively for first six months after birth . But when amount of breast milk decreases or is inadequate , it becomes very distressing. Women and children are wealth of any nation . 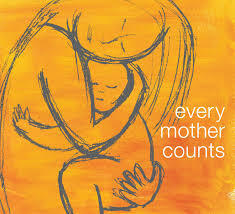 Attention should be given to Mother’s health not only during pregnancy, but throughout life . Ensuring their wellbeing and survival is crucial to the development of a society . Malaria is predominantly a tropical disease . In India and other South Asian countries there is resurgence of malaria . Malaria is made of two Italian words ‘Mal’ – bad and ‘ Aria’ – air . Its synonyms are – Marsh miasma , Remittent fever , Ague , Jungle fever . It is a mosquito borne infectious disease caused by parasitic protozoans of genus Plasmodium , (mainly P. vivax , P. falciparum , P. ovale , P.malariae ) . 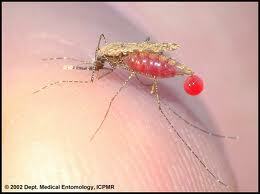 Commonly , the disease is transmitted by a bite from an infected female Anopheles mosquito , which introduces the organisms from its saliva into a person’s circulatory system . The diagnosis is confirmed by the detection of malarial parasites in peripheral blood smear ( PBS ). According to Ayurveda , it is similar to ‘Visham Jwara ‘ which means irregular fever , intermittent fever . Also described as ‘Varunasya Ragya’ in Atharvaveda . Visham jvara is sannipatika in nature , may persist for longer time because of doshas being situated in deeper dhatus ( tissues ) . Varunsya Ragya ( AV 1/25/3 ) i.e Varun depicts ‘Water’ and ‘Ragya’ means disease producing germs ( micro organisms ) that originate from accumulated water , which points towards Visham Jvara . Thus Atharvaveda considers that Agantuja ( external agent ) plays a major role in Visham Jvara . This external agent has been named ‘Makka’ or ‘Mashaka’ which resembles Anopheles mosquito . Pregnant women have an increased risk of infection and parasitaemia may be great due to altered immunity . Malarial parasites may cross placenta , particularly in non – immune mothers leading to congenital malaria . The parasites infest placenta and intervillous spaces become blocked .So , there is diminished blood flow to the fetus . This is mostly seen with Plasmodium falciparum and in the second half of pregnancy . a) Anaemia due to hemolysis and Folic Acid deficiency . b) Hypoglycemia – due to increased glucose consumption both by the host and parasite . d) Jaundice – due to hepatic dysfunction . e) Renal Failure – due to block of renal microcirculation . f) Pulmonary edema and Respiratory distress . g) Convulsions and Coma . Risk and severity of infection are high due to immune compromised state and Complications are high . 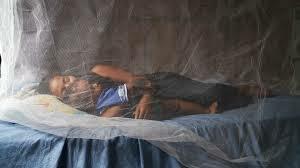 Pyrethroid impregnated mosquito nets and electrically heated mats should be used . Stay indoor during dusk and dawn . Wear socks , long pants , long sleeve shirts when outdoors . Neem oil should be used for spraying . Fumigation with guggulu , neem leaves , haritaki , yellow sarson and ghee should be done . Prophylaxis and Treatment depend on local area , the dominant Plasmodium type and pattern of Drug resistance . Patterns of resistance to Anti malarials change so rapidly that expert advice should always be sought regarding the treatment and prophylaxis . Risks of Malaria is life threatening in pregnancy, so benefits of treatment outweigh the potential risk of anti malarial drugs . The antimalarial drugs when given in therapeutic doses have got no effect on uterine contraction unless uterus is irritable . Along with Antimalarials , Folic Acid should be given daily to prevent anaemia . Luke warm water or Shadanga paniya ( Decoction made with herbs – Motha , Pitpapada , Khas , Rakta chandan , Sugandhabala , Sonth ) should be used for drinking . Soup made with Mudga , Masoor , Chana is beneficial . Yavagu ( Gruel ) prepared with Shashtikshali rice with Pippali and Sonth added to it , should be taken in small quantities when hungry . Giloy juice is helpful . Cold infusion ( Hima / Fant ) made with Chirayata , Motha , Giloy , Sonth or Patha , Khas , Sugandhabala should be used . Chutney made with garlic and sesame seeds is adviced . Treatment should be strictly under supervision . Along with the treatment , Garbhini Paricharya should be followed to safeguard the health of mother and fetus . The top 10 human parasites according to WHO are Ascaris lumbricoides , Hookworm , Malarial parasites , Trichuris trichuria , Amoebae , Filarial worms , Schistosomes , Giardia lamblia , Trypanosomes and Leishmaniasis species . Together these top 10 cause more deaths than anything else apart from HIV/AIDS and Tuberculosis . 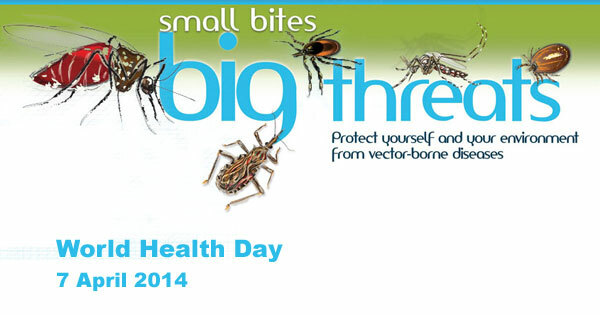 So , this World Health Day should be an opportunity to give an impetus to the efforts in eradicating malaria and Ayurveda has an important role in it . As a complete food – easily given, readily digested and absorbed, milk has long been considered nearly ideal source of nutrients for pregnant woman. In all the Ayurvedic texts, fluids especially milk is indicated during first three months of pregnancy. In ‘Shatpath Brahmana’ milk has been considered as the main food of human beings. Nutrition is needed during first trimester, primarily to support the growth of cells, maturation of the functional levels of organs, development of nervous system and accumulation of fetal energy and nutrient stores. The milk is composed of proteins, vitamins, minerals, carbohydrates, fats, water, which in itself is a complete food and supplements the health of both mother and baby. 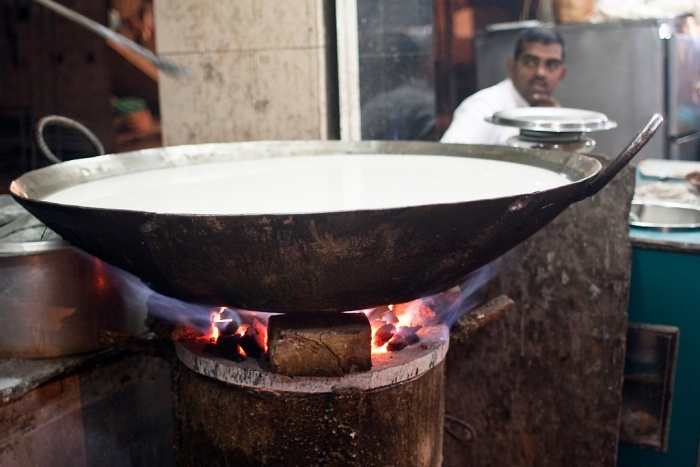 Milk has ten properties – sweet, cold, soft, thick, unctuous, heavy, slow, viscid, glossy and clear. These properties are also present in Ojas or Vitality. 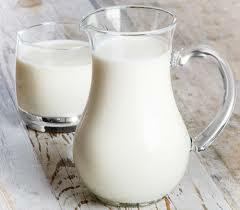 Milk is best among ‘Jeevaniya dravyas’ (Life promoting substances) and is also called ‘Rasayana’ (Rejuvenator). In this article an attempt has been made to understand why intake of milk is given importance during pregnancy. Ayurveda explains that nutrition from mother’s diet provides strength , complexion and normal growth of the fetus . Fetus is considered to be dominated by Kapha, so it needs more unctuous substances to replenish Kapha. Kapha is identical to Ojas (Vitality ) and milk in properties. Thus milk supplements the Kapha and the growth of fetus. As there is increase in body fluids during pregnancy, its intake compensates for it and maintains elasticity of skin. Due to the effect of progesterone, there is decreased muscular contractions of intestine leading to constipation. Water content helps in softening of stools. Casein, the main component of protein, contains all the essential amino acids which builds , repairs and replaces tissues; aids in blood clotting; maintains fluid balance and immune system. Half a liter of milk daily provides 12 – 20 gm of protein. During early pregnancy, woman suffers from nausea, vomiting for which frequent fluid intake especially milk is recommended . The probable reason may be that owing to the high protein and phosphate & citrate content , it exerts a strong buffering action thus lowering the acidity of gastric juice and preventing dehydration. Milk fat is mainly composed of triglycerides and acts as a store for body energy. Milk fat contains carotene which is changed to Vitamin A to help fetus to form healthy, supple skin and aids in vision development. As 60% of human brain is made up of fats, essential fatty acids are important for brain development, nervous system and hormone production. It provides daily energy production. The lactose is the principle carbohydrate sugar present in milk. This enhances the absorption of calcium and prevents constipation and nausea. 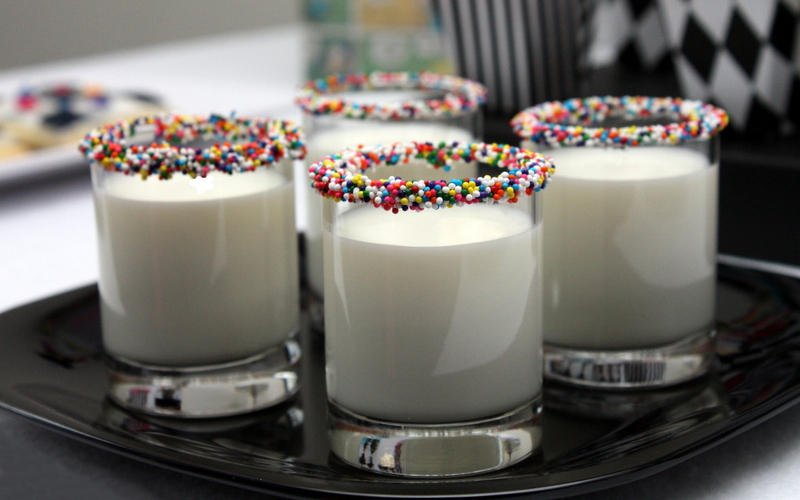 Milk in adequate quantity can supply all the necessary vitamins. 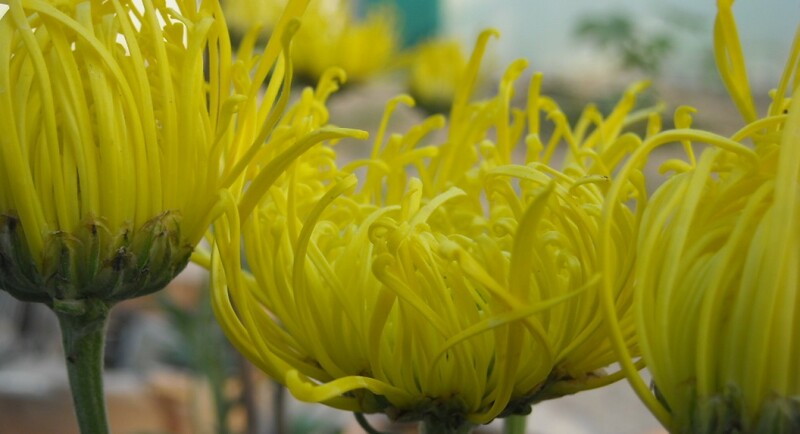 It is essential for healthy skin ,eyes and hair ; increases immunity. It is essential for energy production and growth. It is essential for protein metabolism, healthy skin , nails and hair. Essential for growth and maintenance of blood forming tissues of the bone marrow and of myelin in the nervous system. It is necessary for the synthesis of Thymidylate, the nucleotide of Thymine, which is characteristic base of DNA. With calcium and phosphorus helps in formation of healthy bones and teeth. It is essential to help absorb calcium from gut. Acts with Vitamin B12 to assist in body cell formation. Folic acid is important before and during early pregnancy because at 3rd week of development of fetus, the neural groove is visible. 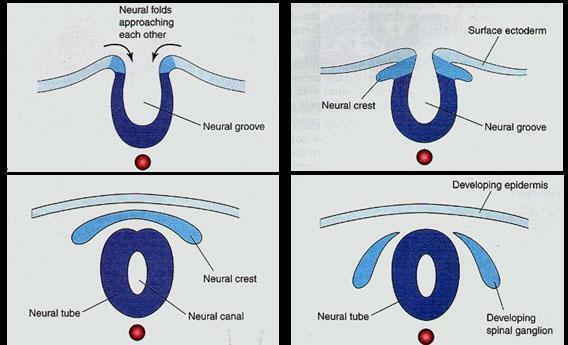 After that the groove start to form neural tube , which forms the basis of the entire nervous system. The closure of neural tube is dependent upon protein bridge bound together by calcium, both of which are present in milk. Diabetes is the most common medical complication of pregnancy and it has increased about 40% . The increasing prevalence of Type 2 Diabetes in general and younger people in particular has led to an increasing number of pregnancies with this complication . – those diagnosed during pregnancy – Gestational . There is keen interest in events that precedes Diabetes which includes the mini environment of the uterus , where it is believed that early imprinting can have effects later in life ( Saudek 2002) . For example in utero exposure to maternal hyperglycemia leads to fetal hyperinsulinemia , causing an increase in fetal fat cells, which leads to obesity and insulin resistance in childhood . This in turn leads to impaired glucose tolerance and Diabetes in adulthood . Thus a cycle of fetal exposure to Diabetes leading to childhood obesity and glucose intolerance is set in motion . Gestational Diabetes Mellitus is defined as carbohydrate intolerance of variable severity with onset or first recognition during the present pregnancy . 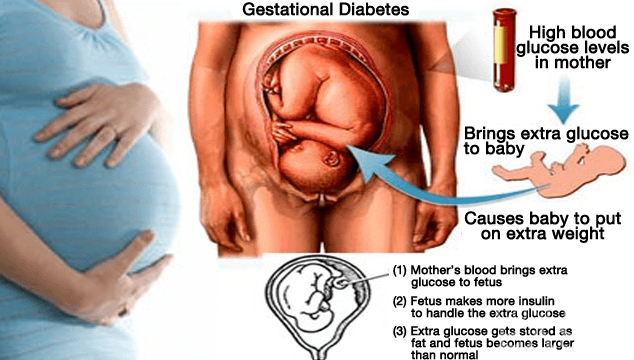 An alternative explanation is that Gestational Diabetes is Type 2 Diabetes unmasked or discovered during pregnancy . The method employed is by using 50 gm oral glucose challenge test without regard to time of day or last meal , between 24 – 28 weeks of pregnancy . A plasma glucose value of 140 mg percent or that of whole blood of 130 mg percent at 1 hour is considered as cut off point for consideration of a 100 gm ( WHO – 75 gm ) glucose tolerance test . a) Increased perinatal loss is associated with fasting hyperglycemia . Fetal anomalies are not increased due to the absence of metabolic disturbance during organogenesis in early pregnancy. 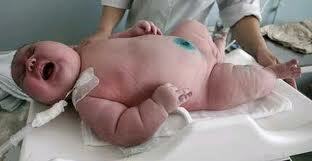 b) Increased incidence of Macrosomia ( Fetal Macrosomia is defined as infants whose birth weight exceeds 4500 gm) . A patient with symptoms of Diabetes Mellitus ( increased urination , increased thirst , weight loss ) and random plasma glucose concentration of 200 mg / dl or more is considered overt diabetic . 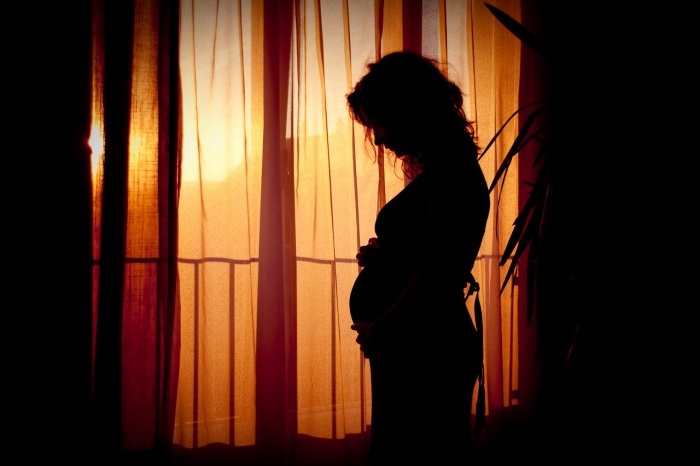 The condition may be pre existing or detected for the first time during present pregnancy . Patients with poor glycemic control and vascular disease are at increased risk of complication of IUD , IUGR , Pre eclampsia and Ketoacidosis . Fetal Macrosomia – With good Diabetic control , incidence of Macrosomia is markedly reduced . Congenital Malformation – It is related to the severity of Diabetes affecting organogenesis , in the first trimester ( both in Type 1 and Type 2 Diabetes ) . 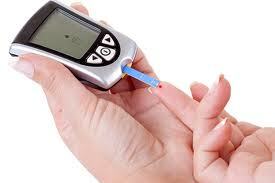 In Ayurveda Madhumeha disease can be correlated with Diabetes Mellitus . 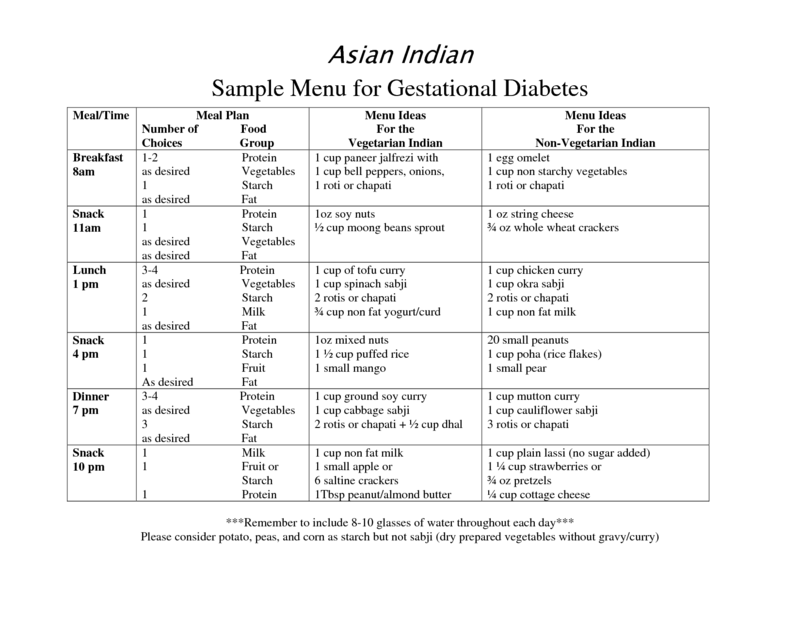 Though there is no direct reference of Gestational Diabetes but Garbha Vriddhi is described as a complication . Garbha Vriddhi : In Garbha Vriddhi , there is excessive increase in size of abdomen and perspiration . Labour is difficult . This can be understood as Overweight fetus or Macrosomia . Ayurveda helps in limiting the maternal and fetal complications . Herbs are helpful as a supportive treatment along with the modern medicine under supervision . Generally beneficial , congenial , purifying and suppressive dietetics and mode of life , not causing loss of doshas and dhatus but capable of decreasing the increased doshas and dhatus should be used . Garbhadhan Vidhi : Pre conception counseling is a must . Vegetables : Bitter gourd , fenugreek leaves , tomatoes , bell pepper , spinach , cucumber , radish , sponge gourd , drumstick leaves & fruits , broccoli , kale , lettuce , cauliflower , cabbage . Pulses : Mainly beans – green gram , bengal gram , black eyed pea , garbanzo beans , chick pea . Spices : Turmeric , cinnamon , garlic , fenugreek seeds . Cereals : Wheat , barley , pearl millet , oats . Fruits : Plums , kiwi , lime , oranges , guava , java plum / black plum , apple, peaches , gooseberry . Dry Fruits : Almond , apricot , walnut . Though the most appropriate diet for women with Gestational Diabetes has not been established , it is suggested that obese women with a body mass index greater than 30 kg / m2 may benefit from a 30 – 33 % caloric restriction . This should be monitored with weekly tests for ketonuria because maternal ketonemia has been linked with impaired psychomotor development in the offspring . Physical Activity : Physical activity during pregnancy reduces the risk of Gestational Diabetes .Resistance exercise helps avoid insulin therapy in overweight women with Gestational Diabetes . Pranayam and Yogasana is beneficial . Herbs : Tinospora cordifolia , Holarrhena antidysenterica , Rubia cordifolia , Emblica officinale , Boerhavia diffusa , Withania somnifera , Tribulis terrestris , Hemidesmus indica etc can be given under supervision .